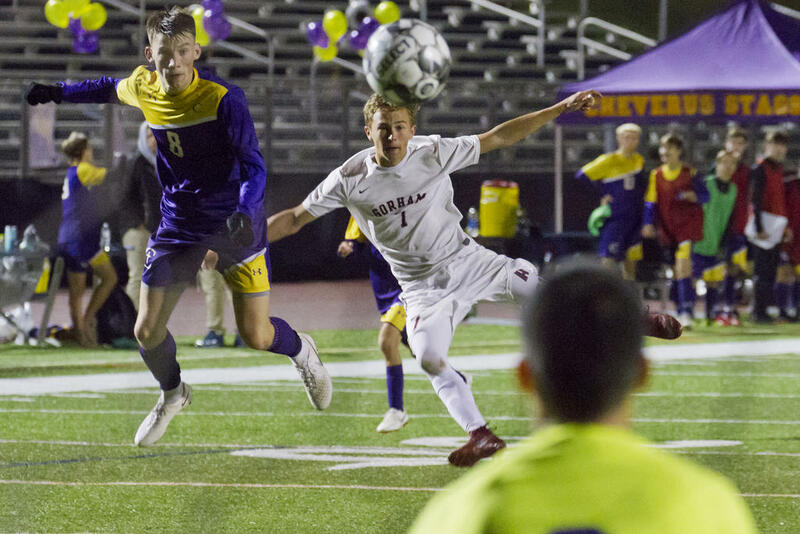 PORTLAND—Gorham and Cheverus battled to a 1-1, double-overtime draw at Fitzpatrick Stadium on Thursday night, Oct. 10, matching each other on second-half goals by Stag James Shimansky and Ram Andrew Rent. The result leaves Gorham, now 12-0-1, atop the standings still – they’ve been there all season long – but bumps Cheverus, now 8-3-2, up from third place to second. The Stags held a narrow advantage in the early action: They couldn’t pin Gorham all the way back in the Rams’ end – Gorham’s too talented, too ferocious, too experienced for that – but they did manage to keep play largely in the Rams’ half of the midfield. Eventually, however, Gorham pushed back, and by the final minutes before the break, were applying substantial pressure. Kevin Mollison logged a near miss from on the Stags’ doorstep around the six-minute mark, for instance, and Ryan Farr logged one not long after, firing off a solid shot from outside-left on a feed across by Rent. Still, the Rams couldn’t get on the board. And Gorham didn’t do all the attacking: Cheverusite Jack Mullen pressed forward up the right side with just 2:16 left on the clock and pulled the trigger on a hard shot from outside. Luckily, Rams ace keeper Trevor Gray stood strong, made the stop. Gorham adjusted during the break, and trotted onto the field for the second half fired up. Early in the second half, Rent recorded the best chance – by either team – of the game to that point: Rent broke away from the pack and tapped the ball swiftly past Cheverus keeper Harrison Bell – but uncharacteristically hit the post with his shot. The action seesawed back-and-forth for the next 23 minutes or so – until, with a mere 13:20 to play, Shimansky put the Stags out front, tallying a redirect goal at the left side of the Rams’ net on a feed from the right corner. The Rams’ strength in second halves, combined with their renewed vigor, hit a peak less than three minutes after Shimansky’s notch. Brady King, who takes the team’s corners because he drops in a lot of perfect set-ups, belted in a beautiful alley-oop from the Stags’ left nook. Rent connected with a hard header, and the ball zipped past Bell for 1-1. Rent’s goal proved the last of the outing, though both teams turned in further chances. The Rams perhaps turned in most of those, but Cheverus undoubtedly turned in the most spectacular, the most dangerous: With just four seconds remaining in regulation, the Stags, deep in Rams territory, fed a cross-ball from the right side through the center and over to the left, where they volleyed a blistering shot toward the Gorham net. Were it not for a thrilling, diving save by Gray, the Rams would’ve lost in the final moments. “From our end, it starts with our goalkeeper,” he said. “Trevor’s so solid, he’s so athletic, and he makes great plays all the time. So he gives us great confidence. Our other four back there are all first-year starters, and they’ve just gotten better and better and better as the year goes on. We like to try to build some of our offense from the back, and get our outside backs up the field, and we were able to do that. Gorham closes their regular season with a home bout vs. Bonny Eagle (13th, 2-6-4) on Tuesday, Oct. 16. Cheverus caps their schedule with a road contest at Biddeford (17th, 0-12-1), also on Tuesday the 16th. Gorham’s Kevin Mollison rips a shot toward the Cheverus net. Andrew Rent scored the Rams’ goal off this header. Matthew Phinney battles for an airball near the Cheverus net. Javin Stickney crashes the Cheverus net. Colby Christakis settles a ball for Gorham. Brady King outpaces a Cheverus opponent. Ram Kyle Hamblen settles a ball. Brady King faces off with a Stags opponent. Andrew Rent crashes forward for the Rams. Gorhamite Brendan Waterman and Cheveruser James Shimansky clash. Alex Burghardt wrestles a Stag.